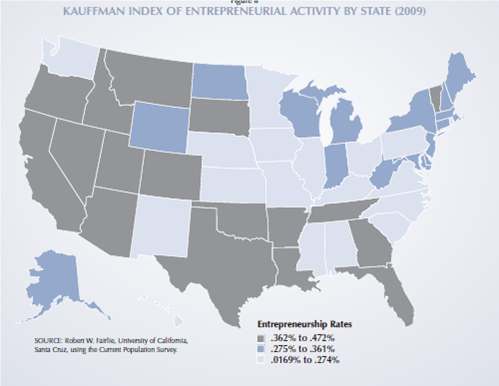 The Kauffman Center’s 2010 report on Entrepreneurship indicates that over the past 10 years Iowa has been in the bottom percentile of states where entrepreneurship are being initiated (1). So how can we change that? How do we get more people excited about the idea of being their own boss and starting a business in a rural county like Tama County? To maintain a healthy rural economy, it is especially important for Tama County to cultivate a workforce and community that recognizes when market opportunities are being missed, and take action to successfully address market gaps. Why is our community so successful in cultivating multiple generations of farmers (agricultural entrepreneurs) but we are less successful in cultivating traditional commercial entrepreneurs? Can we learn from our success and duplicate positive things, while finding solutions for the commercial side barriers? Why were we so successful with record-breaking new entrepreneurial activity in Tama County the first half of the year? We have already exceeded the previous year’s numbers. What are some of the reasons people started or bought businesses at the tail end of the recession in Tama County? Might that speak to core competencies to build on for future growth? Is there adequate access to capital and skilled workers, or are opportunities being missed? Is our next generation a group that we should focus our time and resources on to cultivate rural entrepreneurs? How about our alumni that have moved away and may have an interest in coming back? Business plan competitions, Entrepreneurship retreats, workshops, nonprofit groups can all be vehicles to open people’s minds to possibilities that they may have not considered otherwise. Can our schools, community colleges, local governments play a role to get us to the next level? Free updated financing resources booklets will be available, as well as Tama County’s Entrepreneurial Starter Kits. Bringing together local experts to design and roll out the next generation of entrepreneurship resources and assess what can be improved to strengthen our local entrepreneurship culture. Wed. August 18, 2010, 6:30 p.m. Bringing together visionary leaders, financing resources, and local talent and expertise that can execute great things to make Tama County as visually welcoming and pleasant as possible. Tuesday, August 24, 2010, 6:30 p.m. Please RSVP to joanne@tamacountyiowa.org or (641) 484-3108 for $8 meal starting 6 p.m.